These days you can hardly sit down to a meal at a restaurant or food court without being seated next to a smartphone-wielding Instagram hound. The problem, if you can call if that, has become so rampant that many eateries have banned photography of any sort. Doug Davis, owner of D2 Studios, notes that food-oriented businesses, such as foodie publications, restaurants, food retailers, and bakeries, aren’t the only market for commercial food photography in Dallas. We generally associate food with pleasure and contentment, which explains why high-profile companies like CNN and American Express have enlisted the services of professional food photographers for editorials and advertising. Where else might you use food photography? When you entrust your company’s food photography to an amateur, the results can turn out, shall we say, unpalatable–the difference between Tuna Surprise and sushi made with bluefin tuna. Like the most innovative and flavorful dishes, effective photography comprises several “ingredients” such as lighting, positioning, and color. A photographer must have the expertise, equipment, and experience to convey the texture, aroma, and flavor of the subject. 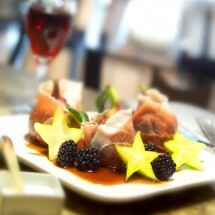 Amateur photographers tend to focus solely on the food itself. Wait, you say, isn’t that a reasonable technique, since we’re talking about food photography? According to Doug Davis, owner of D2 Studios, food may be the subject, but photography should encompass all the surrounding elements, as well. An image of the dish against a solid white background can be effective, but it isn’t a universal fix. When you enlist the services of an experienced photographer, you can be certain that even the most minute detail will be considered. These minor details, including flatware, linens, plates, and glasses should complement the subject, not detract from it.